Nashville-based Christian pop duo for KING & COUNTRY will be making its debut in Singapore next month. The band's latest album Burn The Ships, which was released in October 2018, features ten tracks including the uplifting and energetic lead single, 'joy.'. The song earned the band a 2019 Grammy nomination for Best Contemporary Christian Music Performance/Song. Singapore singer-songwriter, Annette Lee, whose music draws influence from electronic pop and indie rock, will be supporting the show. 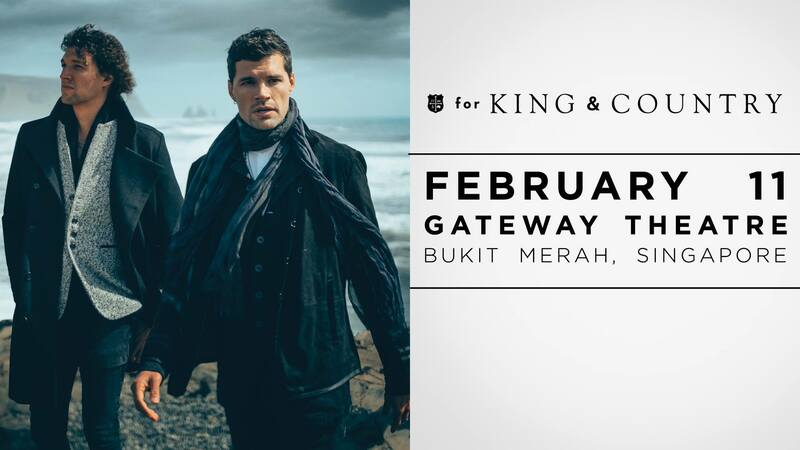 The Assembly presents for KING & COUNTRY will happen on Monday, 11 February, at Gateway Theatre from 7.30 onwards. Tickets, $28, $48, $68 and $88, and, Meet and Greet packages, $50, $70, $90 and $110, are available here.